Goodreads says, "An aristocratic young nun must find a legendary crown in order to save her father—and preserve the Catholic faith from Cromwell’s ruthless terror. The year is 1537. . . Joanna Stafford, a Dominican nun, learns that her favorite cousin has been condemned by Henry VIII to be burned at the stake. Defying the sacred rule of enclosure, Joanna leaves the priory to stand at her cousin’s side. Arrested for interfering with the king’s justice, Joanna, along with her father, is sent to the Tower of London. The ruthless Stephen Gardiner, Bishop of Winchester, takes terrifying steps to force Joanna to agree to spy for him: to save her father’s life she must find an ancient relic—a crown so powerful, it may hold the ability to end the Reformation. Accompanied by two monks, Joanna returns home to Dartford Priory and searches in secret for this long-lost piece of history worn by the Saxon King Athelstan in 937 during the historic battle that first united Britain. But Dartford Priory has become a dangerous place, and when more than one dead body is uncovered, Joanna departs with a sensitive young monk, Brother Edmund, to search elsewhere for the legendary crown. From royal castles with tapestry-filled rooms to Stonehenge to Malmesbury Abbey, the final resting place of King Athelstan, Joanna and Brother Edmund must hurry to find the crown if they want to keep Joanna’s father alive. At Malmesbury, secrets of the crown are revealed that bring to light the fates of the Black Prince, Richard the Lionhearted, and Katherine of Aragon’s first husband, Arthur. The crown’s intensity and strength are beyond the earthly realm and it must not fall into the wrong hands." Joanna Stafford is a Dominican nun, but she isn't your usual nun. She is from the famous Stafford family who is related to the royal family, which makes her aristocracy. She is happy to leave that all behind and become a nun living at peaceful life at Dartford Priory. That is until she gets word that her cousin and best friend is going to be burned at the stake for committing treason. Joanna leaves behind the priory, which isn't allowed, and goes to witness her cousin's unfortunate end. While there, she realizes her father is also there and he ends up interfering, which is a crime. She runs over to her father, but it's too late; now they are both in trouble for interfering with the Henry VIII's justice system. Joanna finds herself in the infamous Tower of London and while there, the Bishop of Winchester visits her offering her a way out as long as she does what he wants. If she doesn't, he will kill her father. Joanna finds herself in a precarious situation; she must find the Athelstan crown for Bishop Winchester which he thinks may be at Dartford Priory. Joanna heads back on this mission along with two monks to look for this crown, but things at the priory have become dangerous. Not only does Joanna need to save her father's life, but she must get the crown before the wrong people do. 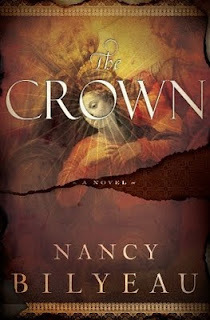 Nancy Bilyeau's debut, The Crown, is a historical romp through Henry the VIII's dangerous England, a quest for an ancient artifact and ultimately, a captivating mystery. Joanna is unlike any of the historical fiction heroines I have read before. I felt for her as she was essentially used as a pawn by Bishop Winchester and she had no choice but to look for the crown as her father's life is at stake. However, while on the quest many more secrets unfold. Since Joanna is a nun readers may think that she is a boring protagonist, but that is not the case. Joanna shared this quest with Brother Edmund and he was also an unlikely "hero" but nevertheless, proved to be an interesting character. Bilyeau does a great job with the secondary characters as well; they are all so eccentric and memorable, especially Lord Chester. The quest for the crown was what kept me invested. In fact the first thirty pages of the book had me on the edge of my seat and my palms sweaty. Talk about intense! I loved how with every piece of information another clue was unturned. There's a lot of secrets and mysteries in The Crown. It definitely kept me guessing and wasn't predictable in the very least. Fans of Dan Brown will definitely enjoy this suspenseful book. My only issue with The Crown is the fact that it lacked a lot of that special sparkle that historical novels by Philippa Gregory always have. For example, there were many subplots that were tedious at times. I wanted more of the focus to be on Joanna's adventure; however, Bilyeau dragged on during certain points. All in all, if you like historical adventures with a touch of mystery, intrigue, and Tudor drama, you will enjoy The Crown. In fact, the ending leaves it open for a sequel. Joanna's adventures continue in The Chalice which comes out this February. Thanks to Touchstone, I am hosting a giveaway for two copies of The Crown and it's open to US and Canadian residents. The deadline is November 4, 2012 and be sure to read my giveaway rules. Good luck! I was glad to see your review because I was reminded that I was planning to read this book! I love historical fiction and hopefully I'd enjoy this book even if it drags at times. Thanks for your review! Thanks for stopping by, guys! I appreciate it.